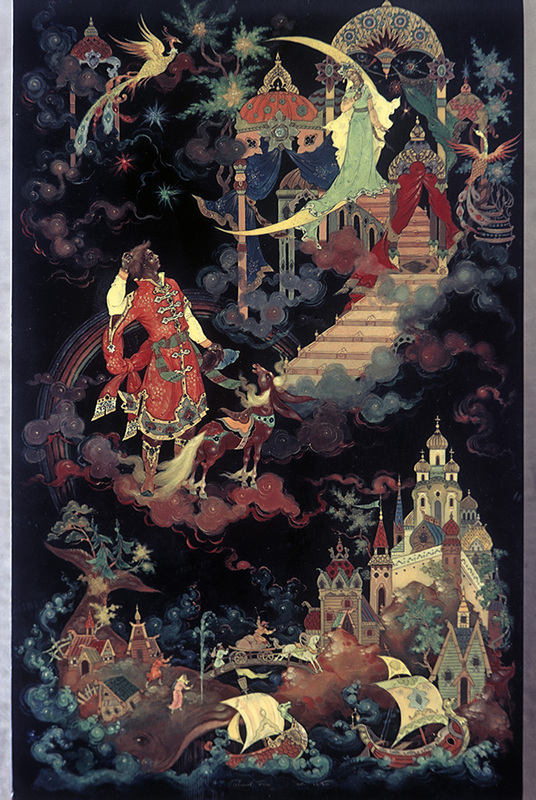 A scene from the Russian folk tale Tsarevitch Ivan, the Fire Bird and the Gray Wolf collected by Alexander Afanasyev in Russian Fairy Tales. 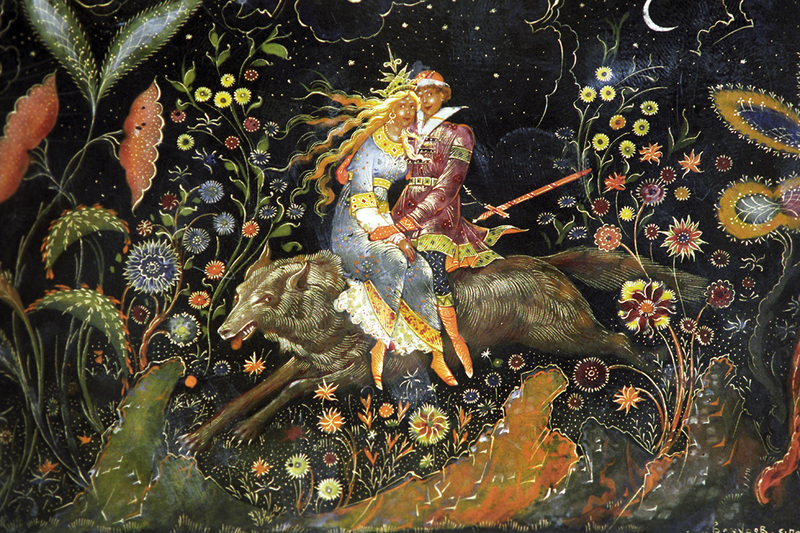 Russian fairy-tales are a great escapist world of beautiful women, brave princes, dark woods, and wondrous animals. 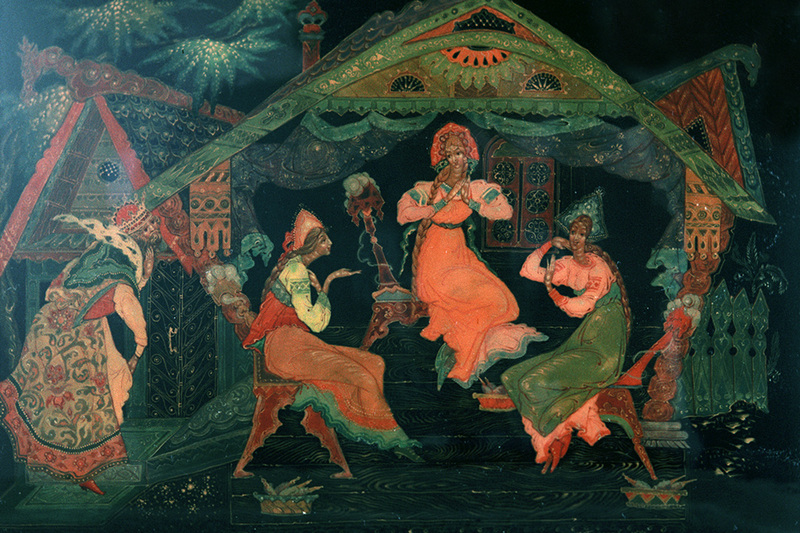 They are the source of many of the motifs found on Palekh lacquer miniatures. Today, Palekh, a small village in the Ivanovo region, 350 km north-east of Moscow on the Golden Ring, is known primarily for its local handicraft. / A scene from The Tale of Tsar Saltan, of His Son the Renowned and Mighty Bogatyr Prince Gvidon Saltanovich, and of the Beautiful Princess-Swan by Alexander Pushkin, 1831 painted on a box. 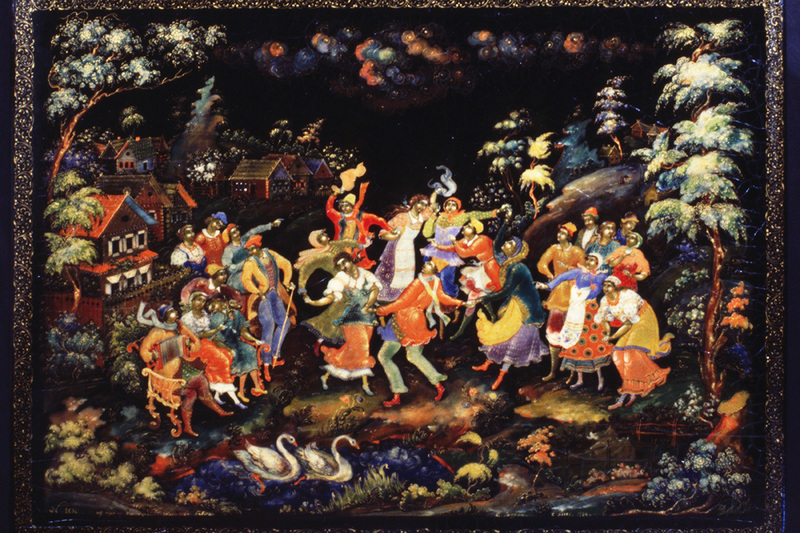 It is home to Russian Palekh lacquer miniature – a traditional craft that produces decorative lacquered boxes, caskets, and brooches. 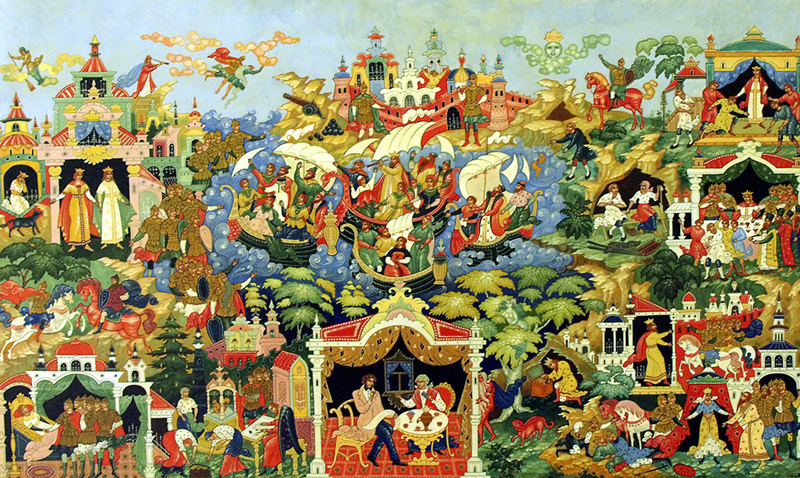 / This painting describes the world of Pushkin’s fairy tales. 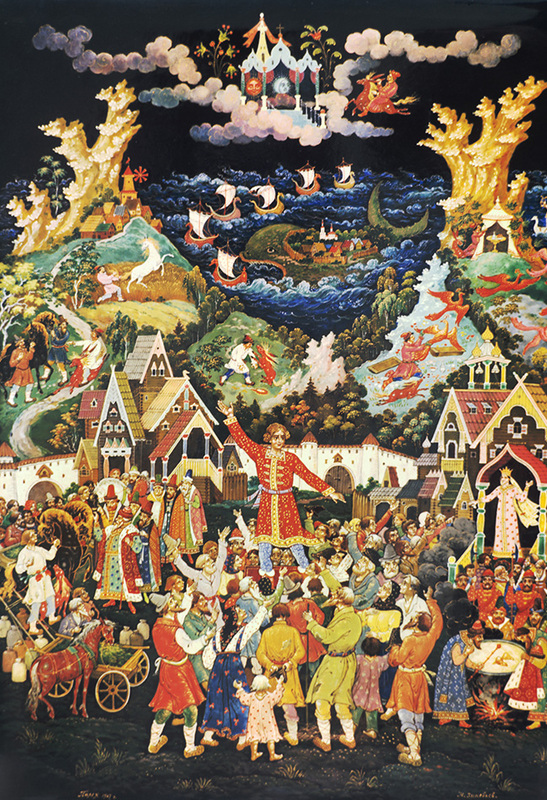 The themes of the paintings are various, including scenes from folklore, Russian fairy-tales along with the Russian women, troikas, views of various towns, and winter landscapes. 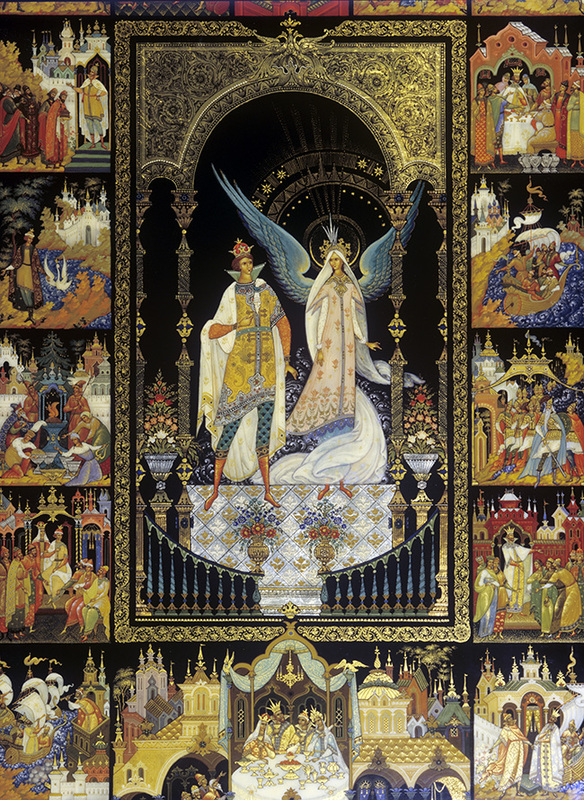 During the Soviet years even Palekh lacquer miniatures were used for propaganda. There were boxes depicting the Red Army fighting for communism, workers’ strikes headed by Vladimir Lenin, and scenes called “Harbinger of Revolution,” “The wind of Revolution,” and “Young workers.” / The Princess-Swan from Alexander Pushkin’s Tale of Tsar Saltan, of His Son the Renowned and Mighty Bogatyr Prince Gvidon Saltanovich, and of the Beautiful Princess-Swan, by Alexandr Pushkin, 1831. Today, fairy-tale motifs are becoming increasingly popular. / The Tale of the Fisherman and the Fish, Alexander Pushkin, 1833. 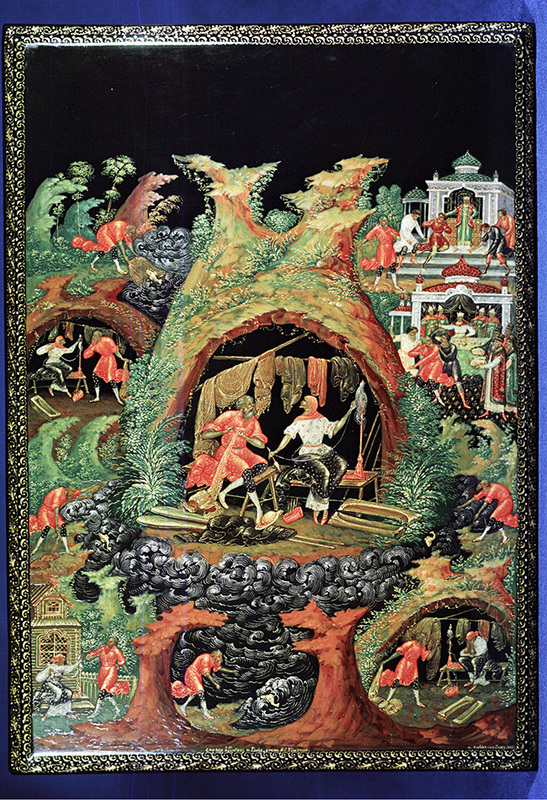 Palekh is also the capital of Russian icon-painting. 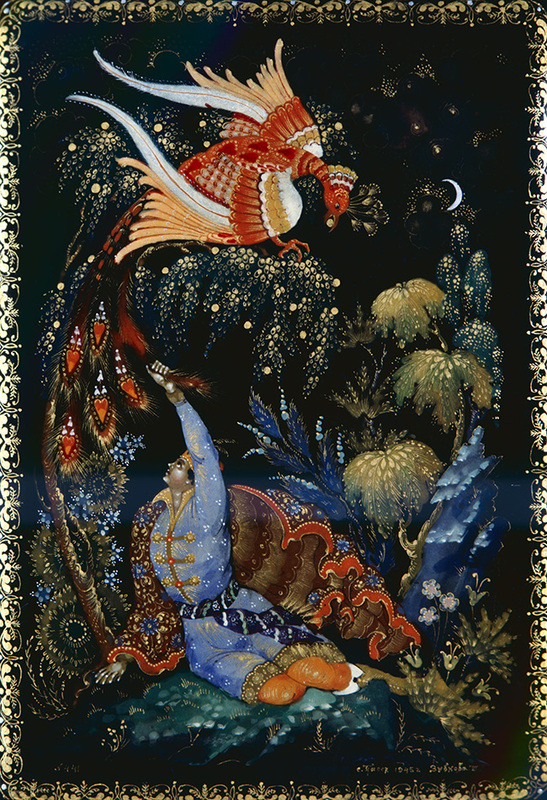 Palekh icon-painting flourished at the beginning of the 19th century and influenced the way Palekh lacquer miniatures were made. / A scene from the fairy-tale The Little Humpbacked Horse by Pyotr Ershov in 1830s. The three women from the beginning of The Tale of Tsar Saltan, of His Son the Renowned and Mighty Bogatyr Prince Gvidon Saltanovich, and of the Beautiful Princess-Swan by Alexander Pushkin, 1831. Tsarevich Ivan, the Firebird and the Gray Wolf collected by Alexander Afanasyev in Russian Fairy Tales. The painting is done mainly on a black background, with rich golden shading. As in icon painting, the three main colors are green, red, and yellow. / A scene from the Russian folk tale Tsarevitch Ivan, the Fire Bird and the Gray Wolf collected by Alexander Afanasyev in Russian Fairy Tales. 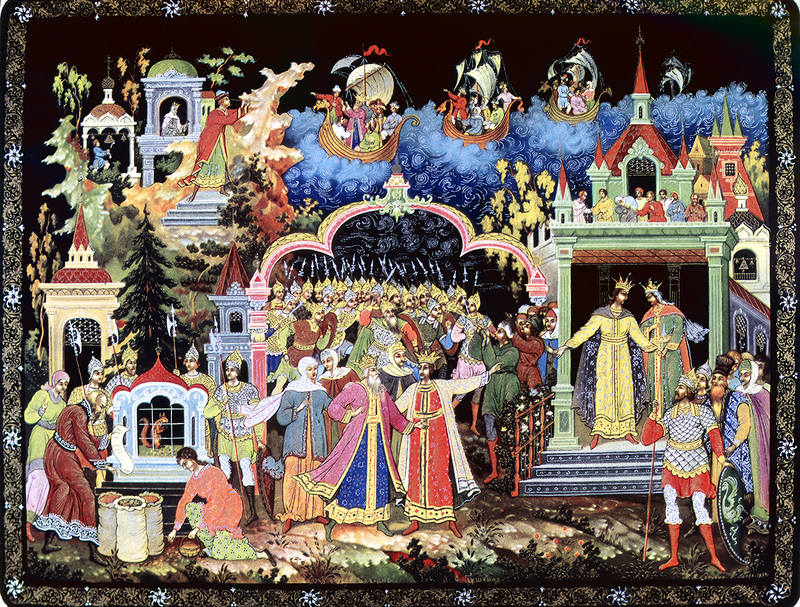 The Marriage of Pavel is a poem based on folklore by Alexei Koltsov, 1836.